Clinical reports link a child’s postural control with functional movements of the upper extremities. 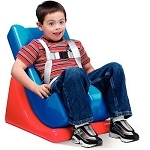 The Kaye Kinder Chairs provide many options to gain the best alignment and postural control possible so that a child can focus on developing and coordinating arm and hand skills. Clinical experts recommend a firm back and appropriate seat depth to align the pelvis and femurs. 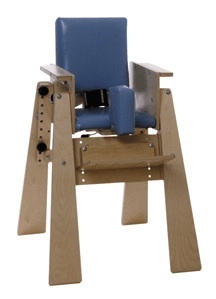 The Kaye Kinder Chairs have an adjustable seat depth that assures that the child’s thighs are well supported to prevent undue internal rotation stress on the femoral heads. The firm back and adjustable seat depth helps maintain the pelvis in the vertical position with thoracic extension. 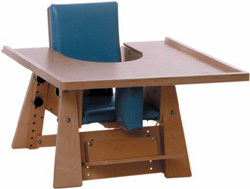 The adjustable footrest supports the feet when the chair is in its higher settings, such as when it is adjusted to fit under a standard table. 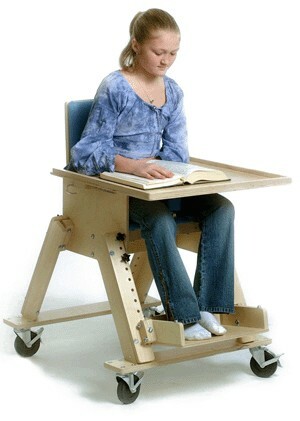 This footrest is removable to allow taller children to rest their feet on the floor when the chair is in the lower settings. The abductor pad at the distal third of the thighs maintains the alignment of the hips and knees and inhibits adduction and internal rotation. 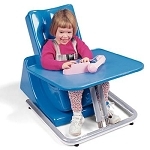 This, combined with the seat belt across the pelvis, decreases the tendency for the child to either push or slide out of the chair. Additional pelvic stability and femoral alignment can be obtained by adding the optional pelvic femoral stabilizer.